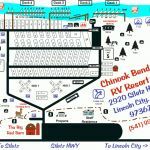 Ask fellow campers about "Chinook Bend RV Resort" and nearby attractions. Not a resort, it is a campground with utilities. Very pretty location by the river, but overgrown weeds and lot of potholes in the gravel roads and the sites. No cable tv or wifi and no cell service. Sites pretty close together and mostly seasonal and run down trailers and fishermen with boat trailers. Quiet and 6 miles to town. The staff was nice and a little store with a lot of fishing stuff and a few groceries, beer etc. Won't stay there again. We camped at Chinook Bend RV Resort in a Fifth Wheel. Roads are gravel and VERY rough. No Wi-Fi, even though they say there is. I had my phone right there and asked why I could not get on and they said it was spotty, but I could never get on (they tell you that you have to be in the building by the street to get on, but not even there.) It is very basic, fisherman's kind of place. Could use some upkeep, but was OK. Nice walking path. We camped at Chinook Bend RV Resort in a Motorhome. Great Location, near a river. WiFi only in the office (1/2 mile away). We camped at Chinook Bend RV Resort in a Fifth Wheel. Previous reviews have given this FREE place to put your RV a low rating. No wi fi and only partial ocean view for free?- go figure. Tonight we have a beautiful Pacific sunset in a place that is safe and easily handles a 45 ft rig. You can go up the street for $50-or $120 in Newport per nite if you like. Sometimes I wonder about expectations when there is no cost. We camped at Chinook Bend RV Resort in a Motorhome. Eat at Kyllos up the street or Tidal Raves in Depot Bay with the $50 you saved in this "parkin lot by the sea". Shop at the outlet mall nearby. It's an amazing place and feels like you are in the wildernesses. Wait, you kind of are. The staff are super friendly and accommodating. The place is in good working order and it's well cared for. This isn't an $85+ type of resort. But it's an amazing experience along the river just 2 miles from the Ocean! We camped at Chinook Bend RV Resort in a Motorhome. If you are fishing or crabbing stop by the store/clubhouse and get the local scoop. All roads are gravel or dirt. The office, store and clubhouse are a half mile away from the campground. Because it had rained, all roads had standing water and mud. Staff were great, though. The 30 amp power shut off 6 times during the night. Very annoying. We camped at Chinook Bend RV Resort in a Fifth Wheel. Kind of a weird campground. Would not call it a resort, that is for sure, but it is a pretty place down on the river, and it was quiet and the spots were wide enough for a big rig. The owners and staff were very nice and made ya feel at home and they have a nice store with a lot of fishing stuff and groceries, beer etc. The negatives are there are quite a few run down ratty trailers that are full time residents. That is not a good look and I do not think there is any rules and regs like leash law etc. There were dogs running around all over. But all and all a pretty cool "rustic" campground and great for fishermen with a boat ramp on site. We camped at Chinook Bend RV Resort in a Fifth Wheel. Lincoln City nearby and lots of fishing and clamming around. Not a resort, but with that said, the staff were very accommodating. No Wi-Fi or phone service at sites was my biggest disappointment. We ended up stay 2 more nights than originally booked and they were very helpful. You are allowed on any holidays with Passport America and can stay as long as desired, but we stayed with Coast to Coast. With C to C we were able to also stay any holiday. We camped at Chinook Bend RV Resort in a Fifth Wheel. Chinook Bend Resort.... Resort it is not... Out of all the 47 states we have traveled this is the number one worst campground we have ever stayed. It was dirty, run down, and trashy. The employees were not friendly and we're never around. The pictures on the website are deceiving and made the background appear to be clean. There are old rundown campers sitting around that have mold growing on them. There are leash rules for owners to use for their pets, but these rules are not enforced. We used Coast To Coast Resorts to find this campground and I wish they would do an inspection of this facility because it is defiantly not up to their resort standards. There was not cell service or WiFi available, but you could have cable for a charge. Anyway, make reservations at your own risk...... It was horrible. We camped at Chinook Bend RV Resort in a Fifth Wheel. As has been said, this is rustic, dirty, in disrepair, not deserving of being called a resort. BUT, if you like watching riparian fowl, this is a fun place. Several Great Blue Heron seem to call this area home as well as Belted Kingfisher. When the fog lies out over the landscape and the river, it's quite enchanting. Don't go here for the recreation or it will cost you. Don't go here for the resort feel. Do go here for watching wildlife along the river, including the fisher folk. We camped at Chinook Bend RV Resort in a Motorhome. The one saving grace for this dump is it was very quiet. It is right on the river with a boat launch. The place is dead or overgrown grass gravel and dirt and they have you jammed in with barely room for your car. The docks are "rustic", the bath/showers dirty and trashes full/overflowing. Many old trailers in various stages of disrepair. They call themselves a "resort" & charge fees for everything, they charge $8 to launch boats & wanted to charge us $5 to launch our inflatable kayak. 50A service? Extra charge. Pull through site? Extra charge. You wash your own rig? Extra charge. There was garbage strewn about throughout the property. We will not return. We camped at Chinook Bend RV Resort in a Motorhome. If you like to fish, this is the place. Great relaxing atmosphere right on the river. They were very busy when we arrived so we ended up on in The Hub. Great grassy area where the rv's backed up like spokes to the center utility pole. No sewer, but they did loan us their blue boy to empty our black tanks. The fishermen were having a great time while we were there. We really enjoyed it. Rate reflects Coast-to-Coast Premier membership. We hope to return in the next few years. We camped at Chinook Bend RV Resort in a Fifth Wheel. No Wi-Fi, even though they say there is. I had my phone right there and asked why I could not get on and they said it was spotty, but I could never get on (they tell you that you have to be in the building by the street to get on, but not even there.) It is very basic, fisherman's kind of place. Could use some upkeep, but was OK. Nice walking path. We camped at Chinook Bend RV Resort in a Motorhome. Park was nice and stayed near river. We stayed for 10 days through the 4th of July. The park was very busy and I felt they over booked the area had people all over the place with no organization to where people were placed. Used the laundry room two of four washers worked right. Two didn’t drain properly and had to ring the water out of clothes by hand. Dryers very slow after 2 cycles so decided to hang dry. Bathrooms smelled gross and not very clean. When the busy weekend was over there was debris and garbage that campers left behind & it was never cleaned up until the wind I guess blew it away. Hired help/owners kids frequently used foul language not considering who’s around. When checking in had to show them the emailed price where their computer price was different from email. I feel this place needs a lot of help or organization. Owners were very nice, and I think try, but I will not be staying again We camped at Chinook Bend RV Resort in a Fifth Wheel. Are you affiliated with Chinook Bend RV Resort ?